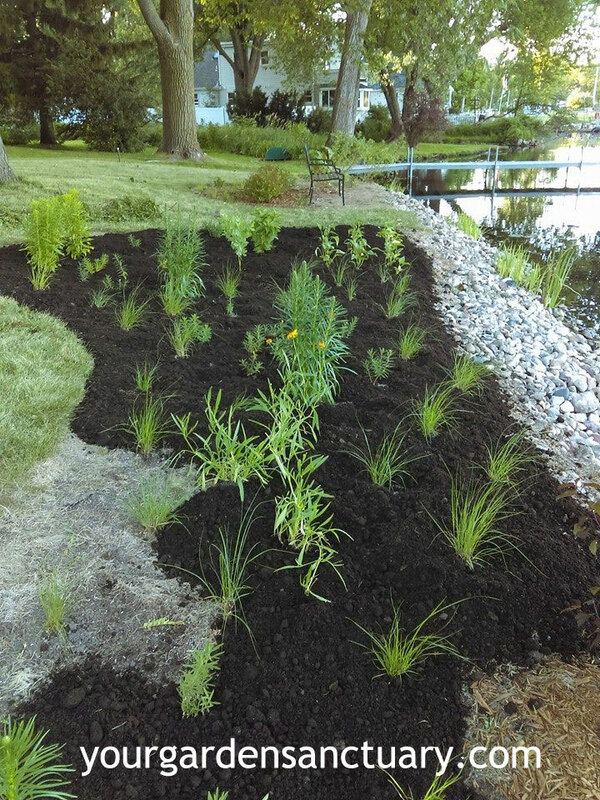 Last year, I posted about a new perennial plug planting I did in June of 2016. 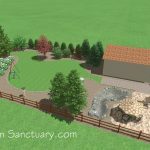 In that post, Planting Plugs is a Cheap and Easy Way to Plant a Landscape, I showed how a 300 sq ft perennial bed could be prepared and planted using less work and money. 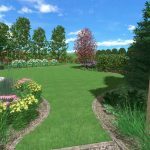 NOTE: if you are the type that wants to dig out your grass and haul away the best 3 inches of your soil, then bring in and spread topsoil full of all kinds of weed seeds, skip ahead to the next section. 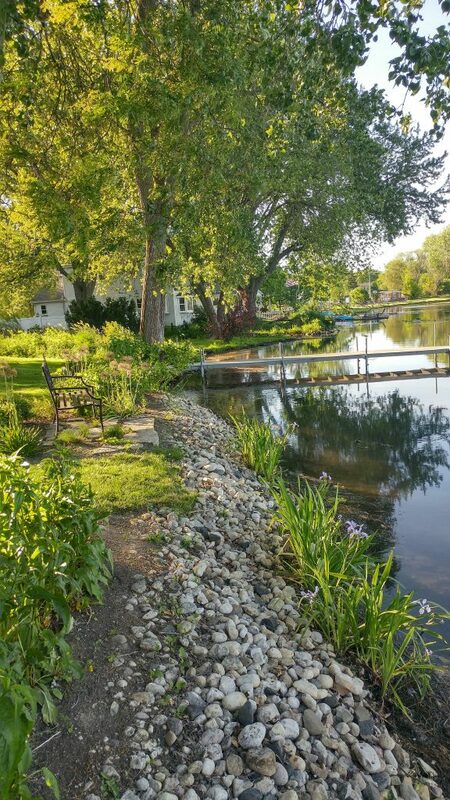 First, I killed the grass using an aquatic safe version of glyphosate, Aquaneat, as I live on a lake and know regular formulations of glyphosate are a no no for use near water. Yes, it is a chemical I would prefer to not use, but with proper precautions it can be used safely. I feel using glyphosate once or twice in an area to prepare a bed and then never having to use it again is a viable option. My much bigger concern is the insane amounts of this chemical that are applied to Round Up™ ready corn, soybeans and other crops. We won’t be eating the grass we kill with glyphosate. By the way, if you are eating most any food that is not GMO Free(Genetically Modified organism), you are eating food made with crops sprayed with glyphosate. Yuck! There are other ways of killing grass, such as sheet composting and solarization, which I have also used. These can be just as effective, but take longer and more planning. Here is a good explanation of one method. There are also some organic sprays (mostly clove and citrus oil) that have promise (more on that in a future post). While I just pulled the weeds on the shoreline, I did use Aquaneat herbicide on the grass in the yard. I then planted it using plugs, a Proplugger™ and forced child labor. Perennial Plug Planting with ProPlugger in Process. 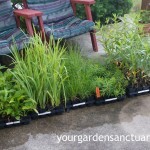 I included a few larger perennials that I could not get in plug size in the planting. 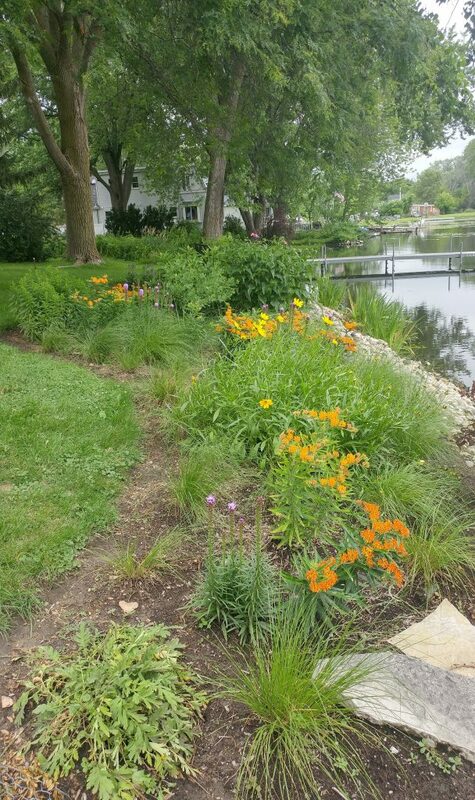 So what does this perennial plug planting look like one year later? Since I did know that I would not have a lot blooming in this bed in the Spring, I did add a bunch of (non native) Purple Sensation Allium bulbs in the Fall of last year. I am glad I did, because I had something happening this Spring before June. Here is what they looked like in May. 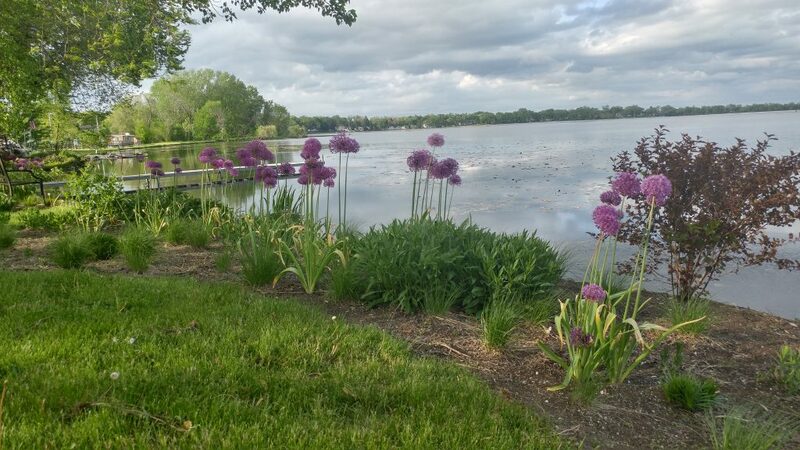 Adding Purple Sensation Allium bulbs to my perennial plug planting last Fall paid off this May. Those little Blue Flag Iris plugs Catherine planted less than a year earlier in the shoreline below this bed looked great in bloom this Spring. 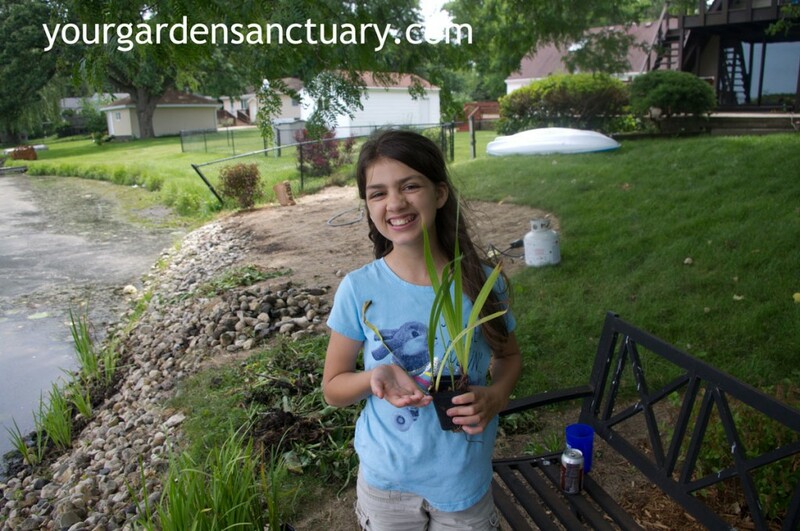 Blue Flag Iris plug ready to get planted INTO rip rap. I really was not expecting many blooms the year after planting these, but I am happy to have them this early. 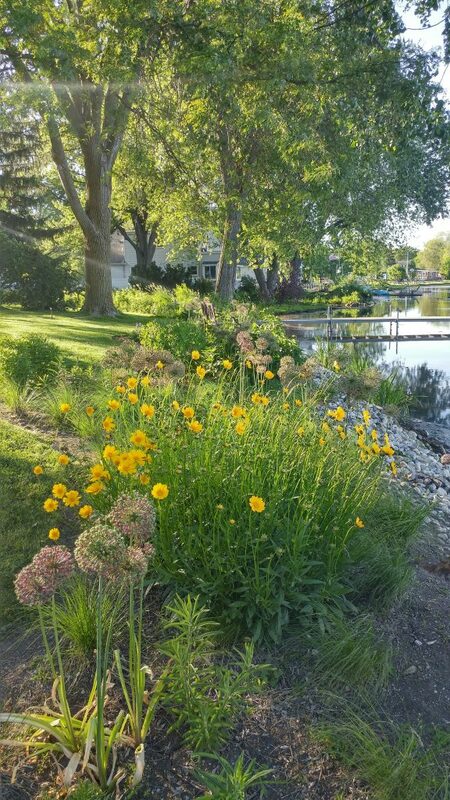 Here is a shot of my Sand or it’s other name, Lance-leaf Coreopsis (Coreopsis lanceolata) in bloom with Allium seed heads on June 7th. Sand Coreopsis was by far the most vigorous of the plants in the first year. The white blooms on the Coppertina Ninebark stand in contrast to it’s purple foliage. The Yellow flowers of the Sand Coreopsis contrast with it. 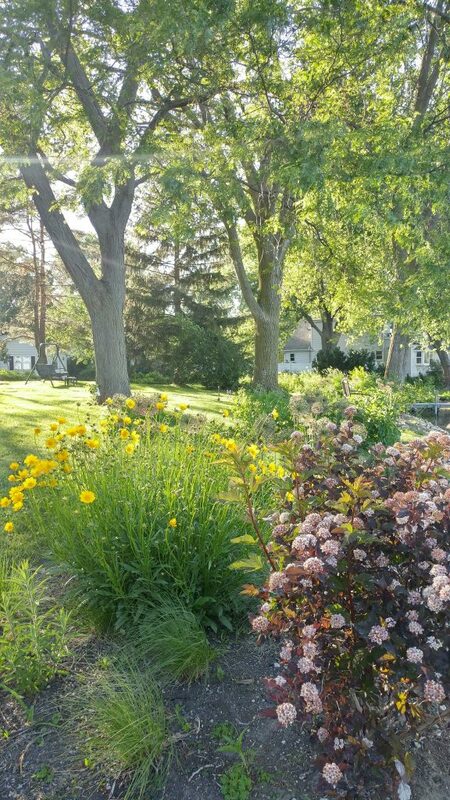 In late June the garden is in full swing. 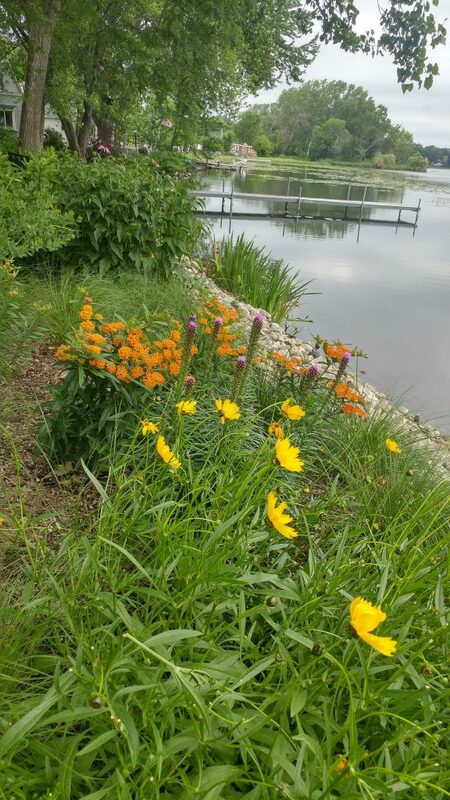 The green Prairie Dropseed mounds are starting to fill in, the purple Liatris are beginning their bloom, the yellow Coreopsis are ending their first flush of blooms, and the Orange Butterfly weed are supplying the fireworks. Prairie Dropseed starting to fill out in early Summer. By the end of Summer this warm season grass should be a nice larger mass of foliage as it grows most when it is hot out. 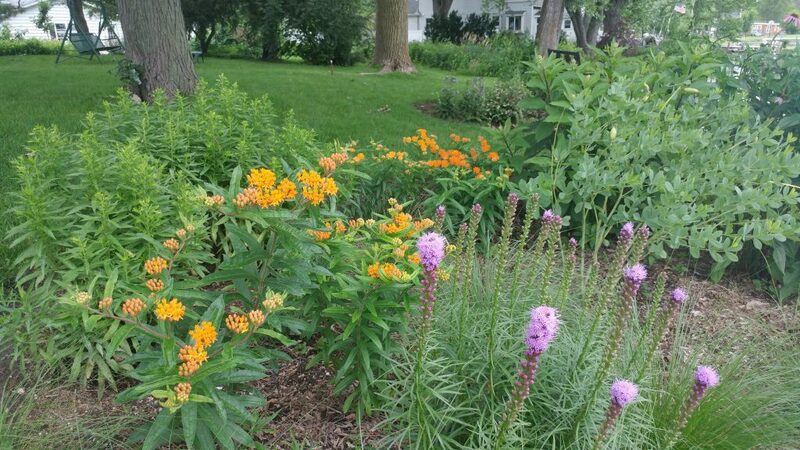 Yellow Coreopsis and Orange Butterfly Weed in bloom beginning to be joined by the purple blooms of Liatris. 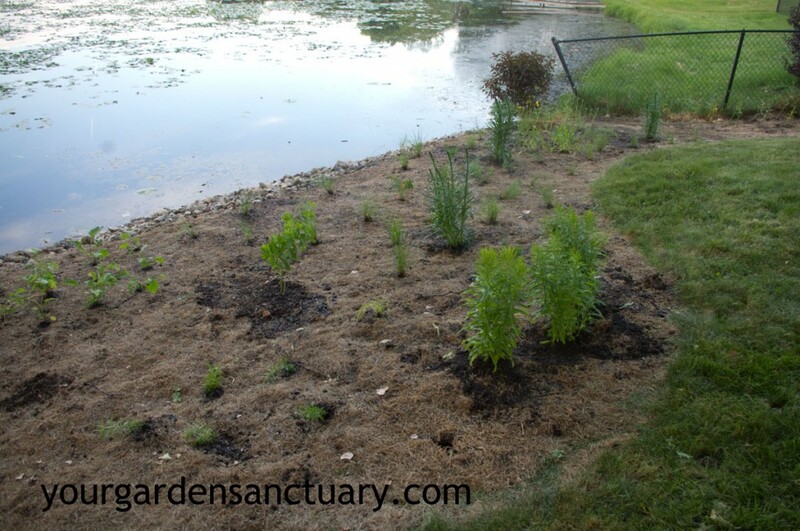 Another view of the bed showing the Purple Coneflower joining the party. 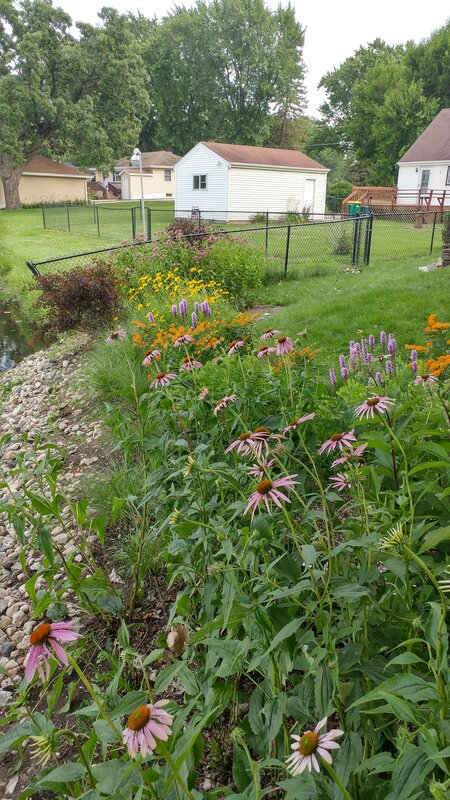 Another view of the bed showing the Purple Coneflower just starting to bloom, while the Joe Pye Weed, Little Lemon Goldenrod, and Asters are waiting to later this Summer/Fall to bloom.. The Blue Ice Amsonia in the front of them and the Baptisia australis finished blooming several weeks ago. Unfortunately I can not find any photos of those very nice blooms. 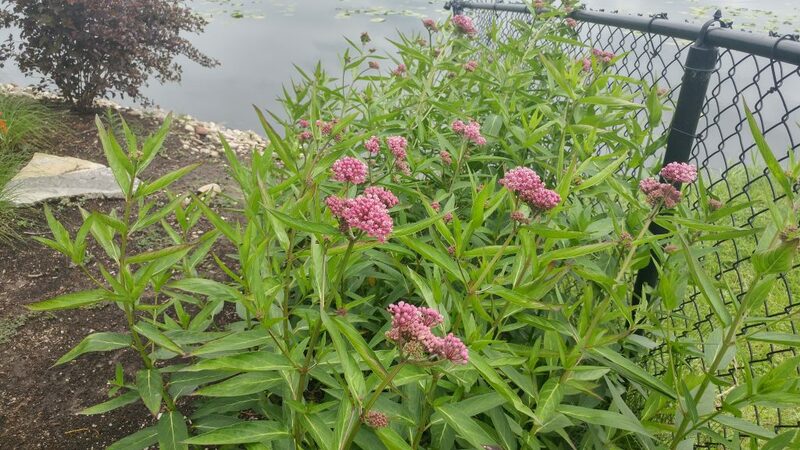 In Late June the Swamp Milkweed are also starting to bloom. Swamp milkweed in bloom, waiting for Monarchs to arrive and lay eggs. 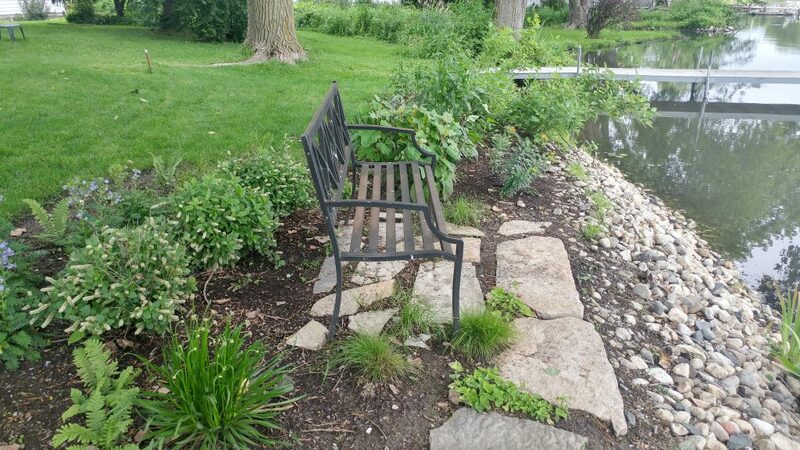 Now that I have seen this garden for 12 months, I have some problems/ideas on how to improve my perennial plug planting going forward. While I did know that Butterfly weed was late waking up in the Spring, I forgot just how REALLY slow they are coming up. Since I planted almost a full flat (32) of these in my yard and a lot of those is this bed, there was some serious voids in the Spring. 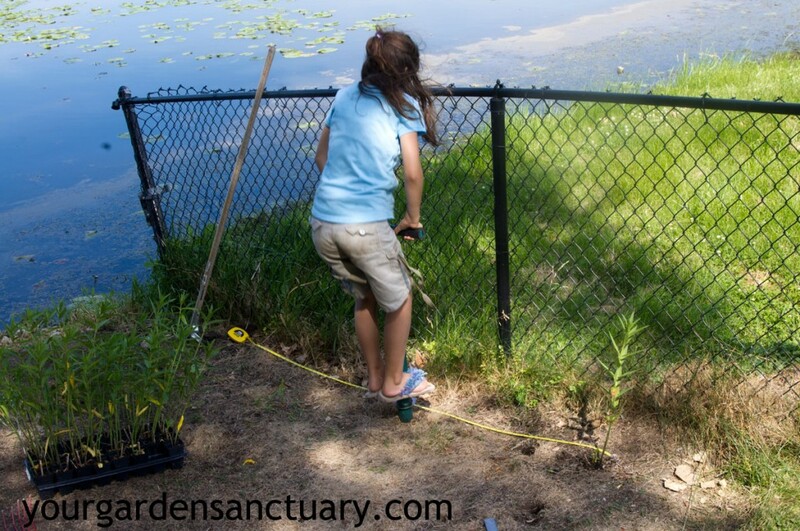 Every problem is a potential opportunity in the garden. My solution is to plant some Spring ephemerals in those voids. These are plants that will come up early and then die to the ground in the Summer just as my Butterfly weed get growing. There are lots of choices here, but I am partial to two for this spot. 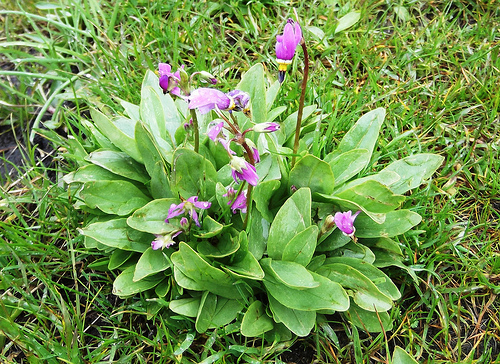 The first is Shootingstar (Dodecatheon meadia) which is a prairie ephemeral and fits in perfectly with this planting. I actually had planned to do this last year, but never got around to it. 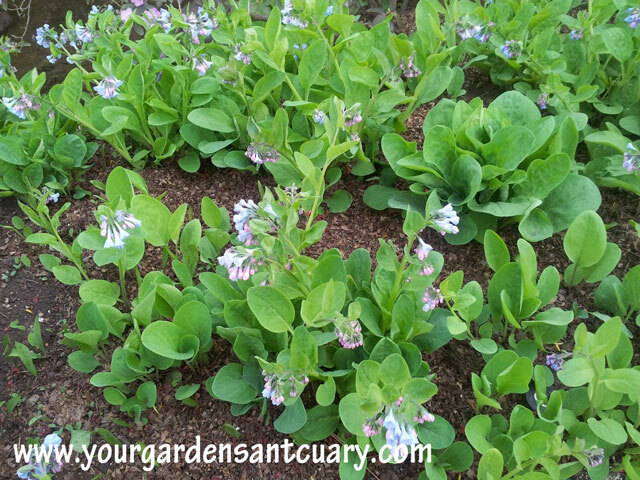 The second is Virginia Bluebells (Mertensia virginica), a favorite of mine. Virginia Bluebells would not normally be associated with the sun loving Butterfly weed, but may work very nicely in parts of the bed with a bit of the shade. Virginia bluebell flowers range in color from bluish purple to soft pink). They are always pastels. I am too impatient for seeds, so I will get some bare root Shooting Stars and Virginia Bluebells. 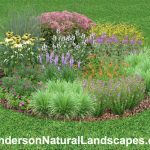 Spring blooming perennials are best planted in the fall. This gives the roots time to establish, and allows the plants a strong start the following spring. 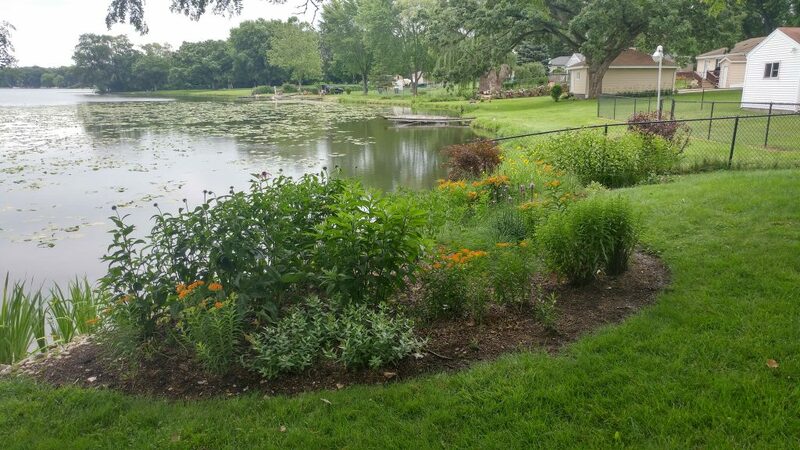 The resulting blooms will not only help fill out the bare spots for slow emerging Butterfly weed, but will also benefit early season pollinators, as well. I also found that my Little Lemon Goldenrod get full size real quick, unlike my Asters (another Fall bloomer) that stays small to later in the season. I may move them around to a spot a bit further back in the garden so their relatively tall Spring height will look more in place. Just for kicks, I will show the other bed (in more shade) that I started last year next to this one. 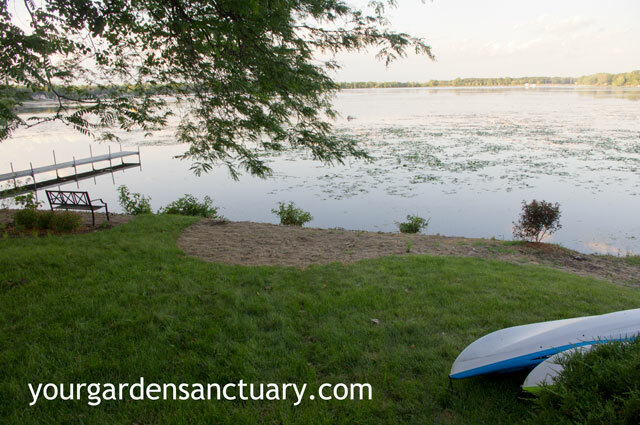 See my Backyard Landscape design finished post for a bit more on this one. I hope you will post regular updates on this garden bed. Very nice. Would love to see it every couple weeks or monthly, at least. Where do you get plugs? Not something I’ve noticed in the nurseries. 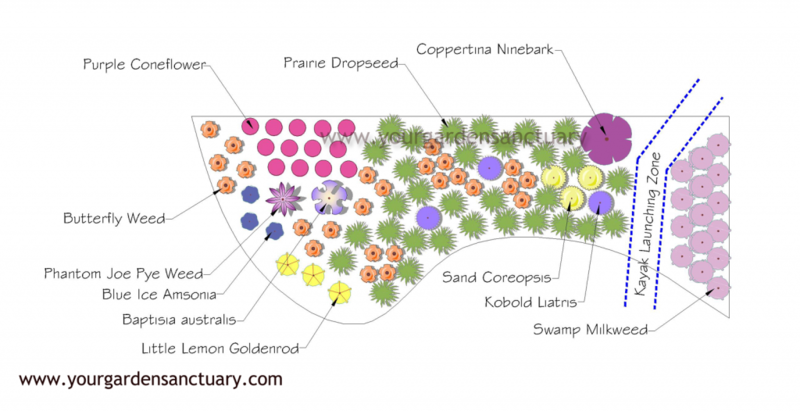 Native plant nurseries or I grow them from seed myself.